As RECON prepares for our our upcoming campaign early Wednesday morning this week, we thought we would take this opportunity to point out some of the interesting information found on the Event Detail Page for each RECON event. The Event Detail Page for every campaign starts with useful information characterizing the event. An object named (281371) 08FC76 is going to occult a star named UC4-565-008609. The predicted shadow reaches the point closest to Earth’s center at 11:55:36 Universal Time on November 23, 2016. We provide J2000 coordinates (the RA and DEC of the target star back in 2000) and equinox of date coordinates (the RA and DEC for the star today). Note that the coordinates are close but not exactly the same because Earth is slow precessing (or wobbling) on its axis. Our CPC-1100 telescopes use equinox of date coordinates. The target star is faint — magnitude of 14.6 using a Red (R) filter — but about 100x brighter than the TNO — magnitude 19.3 using a Visible (V) filter). Every 5 orders of magnitude is 100 times fainter. RECON setups can measure down to about magnitude 16, which means our sites will be able to record the star but will record no signal when the fainter TNO is passes in front of it —fingers crossed! The waning crescent Moon should not be an issue for this campaign. It is only 29% illuminated and reasonably far away (115 degrees) from the target. For our upcoming event, the centerline passes directly over the RECON network. Click the link on the page for a detailed RECON map of the network. To the right of the globe are details about the position, motion, size, and dynamical classification of the TNO. In this case, we are dealing with a Centaur which, at 10.6 AU, is currently just outside the orbit of Saturn. Note that we don’t know the actual albedo, or reflectivity, of the Centaur — that’s another thing we will be able to determine if we measure the object’s size. The 1-sigma uncertainty in time for the event is 47 seconds and the cross-track uncertainty is 595 km. This means that there is a 68% chance that the prediction times listed are good to within 47 seconds, and a 68% chance that the shadow will land within 595 km of the centerline shown. This is why we need so many telescopes and need to record video lasting longer than a few minutes. Next, we provide teams with a star training set. This is a list of 5-6 stars, in addition to the target star, that can be used to provide an indication of how accurately the telescope is aligned and in what direction. You’ll notice that the magnitudes of the stars listed are going from brightest (mag 0.8) to dimmest (mag 14.6), and that the separation between the star and the target is getting smaller (from 11.52 degrees down to 0.24 degrees). By pointing the telescope at each object, the team can get a sense of where the target is likely to appear in the camera field of view when they use the final coordinates for TNO (281371) 08FC76. 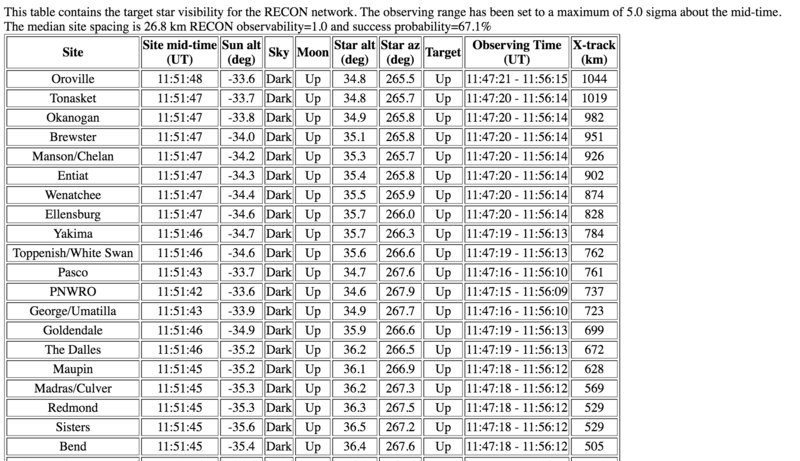 Following this, an automatically generated star chart shows nearby stars along with a green rectangle representing the RECON camera field of view. Note that we are still tweaking how this star chart displays, and for now the star chart provided on the Event Page is a better depiction of the star field at the actual time of the event. Finally, we provide a table listing all of our RECON sites along with useful information unique to each location. Among other information, the text just above the table provides an indication of the median spacing of the RECON network for this event (26.8 km) and the probability of success assuming clear skies (67.1%). 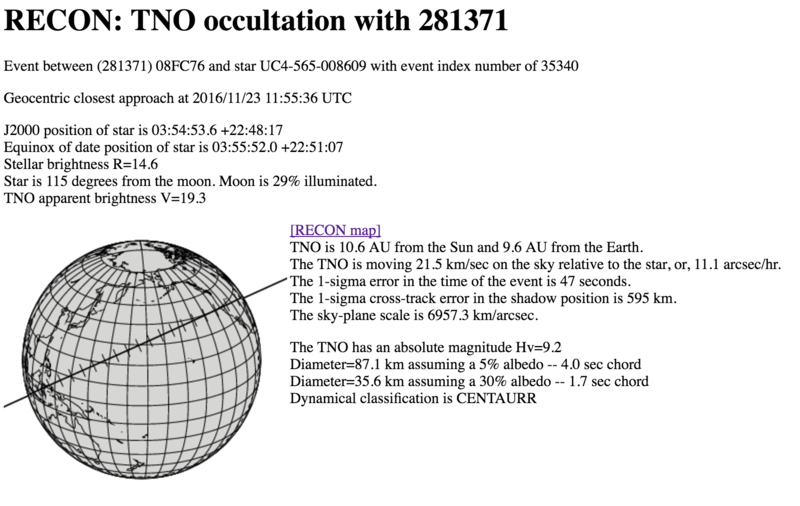 These REALLY good odds for TNO occultation astronomy are only made possible by our awesome network of team members spanning a baseline of roughly 1,700 km. The probability takes into account the uncertainty in the position of the TNO and the target star, the estimated size of the object, and the median spacing of telescopes across the network. For all of our sites the Sun is down (negative altitude), the sky is dark, and the Moon is up. The position of the star (star altitude and azimuth) is provided for each site. 10 degrees corresponds to a fist held at arms length. Due north is 0 degrees azimuth, 90 degrees is east, 180 degrees is south, and 270 degrees is west. For Oroville during the event time, the star will be 34.8 degrees above the horizon (about three and a half fists) and in the direction of 265 degrees, or just 5 degrees south of due west. Remember the 1-sigma cross track error of 595 km above? For each site the table lists how far the site is from the centerline prediction. Note that all RECON sites south of Madras/Culver (X-track = 569 km) are within the 1-sigma zone. The recording window for Oroville is 11:47:21-11:56:15 UT (see above). Because they are on Pacific Time, our Oroville team will subtract 8 hours and record from 03:47:21-03:56:15 PST. The recording window for Yuma Arizona is 11:46:54-11:55:48 UT (see below). Because Yuma (and all of Arizona) are on Mountain Time, our team there will subtract 7 hours and record from 04:46:54-04:55:48 MST. Our team in Laughlin/Bullhead City, with a start time of 11:46:56 UT, is in the funkiest situation (see below). If the team observes from Laughlin, Nevada, they will start recording at 03:46:56 PST; if they are in Bullhead City, Arizona, they will start recording at 04:46:56 MST. Both are the same Universal Time which is why astronomers prefer to use UT rather than local time! The final table provided on the Event Detail page is the same star training set using J2000 coordinates. Some of our volunteer sties are using scopes that use J2000 coordinates, unlike our RECON Celestron scopes. Standard RECON sites should use the star training table at the top of the page above the star chart! As with all science, RECON is a work in progress, and we will continue to refine our predication and observation planning tools. All of the above useful information is available for each occultation prediction found on the Global TNO Event Candidate List and RECON TNO Event Watchlist. Each of these lists is updated weekly and provides predictions looking two years into the future – including our next RECON event after this week involving Centaur 14UT114 on 11 December, 2016 UT. This entry was posted in Guides, Preparations, RECON Science by John. Bookmark the permalink.